At Maui Vacation Consultants, we want you to have the best time here in Maui. So we have selected the best companies for your island activities. Following is a list of tours and shows that we highly recommend. Please remember that during peak times of the year, many activities will sell out in advance. We suggest booking your activities at least 2 weeks prior to your arrival. We will be happy to make all the arrangements for you and will provide you with your activity tickets. While we make every effort to provide you with the most accurate, up-to-date information, occasionally, activity companies may change their prices. Old Lahaina Luau is a very traditional luau located oceanfront in Lahaina. 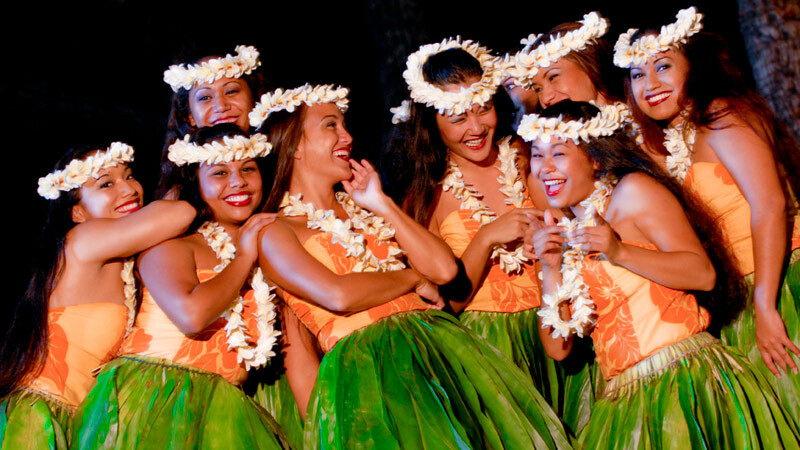 All of the dances are Hawaiian and tell a story of how hula has changed over the years. It is a great show. They have a choice of traditional mat seating on mats, cushions and low tables or regular table and chair seating. Open bar, full buffet dinner and a fresh flower lei. Cost is $120 + tax, children 12 and under $75. Times vary with sunset. Seating is based on when reservations are made, so let’s book this one in advance. 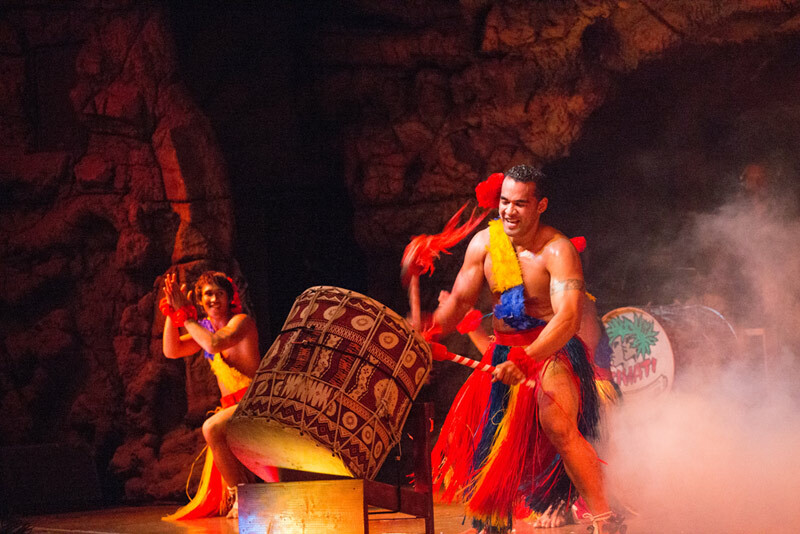 The Drums of the Pacific Luau at the Hyatt Maui is a fun night of Polynesian Entertainment. 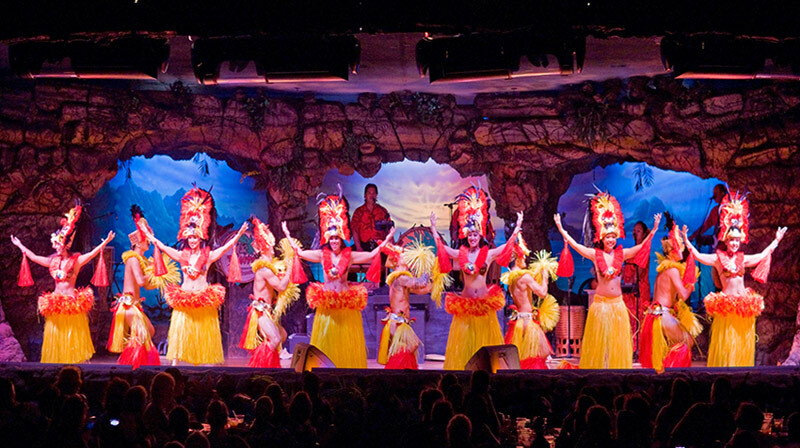 This luau will take you to Hawaii, Samoa, Tonga and New Zealand in the different songs and dances. The finale is the amazing fire dancer. They have the open bar, dinner and dessert buffet, arts and crafts. General seating is $126 + tax for adults, kids 6-12 are $74 + tax. 5 and under are free. Preferred seating is $141 + tax for adults, kids 6-12 are $74 + tax. 5 and under are free. 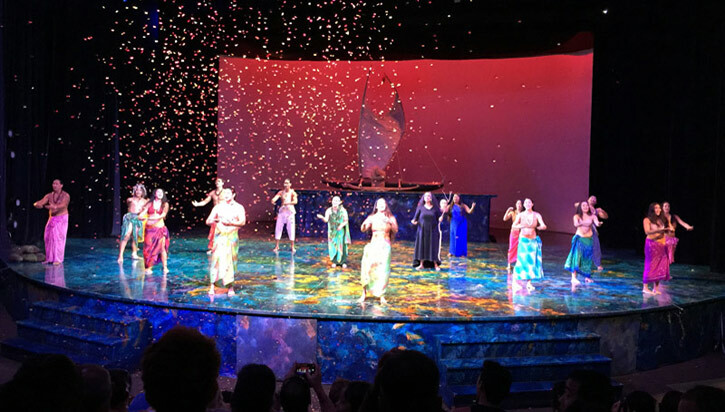 Ulalena is a production at the Maui Theater that is truly spectacular. There isn’t any English spoken, all Hawaiian. 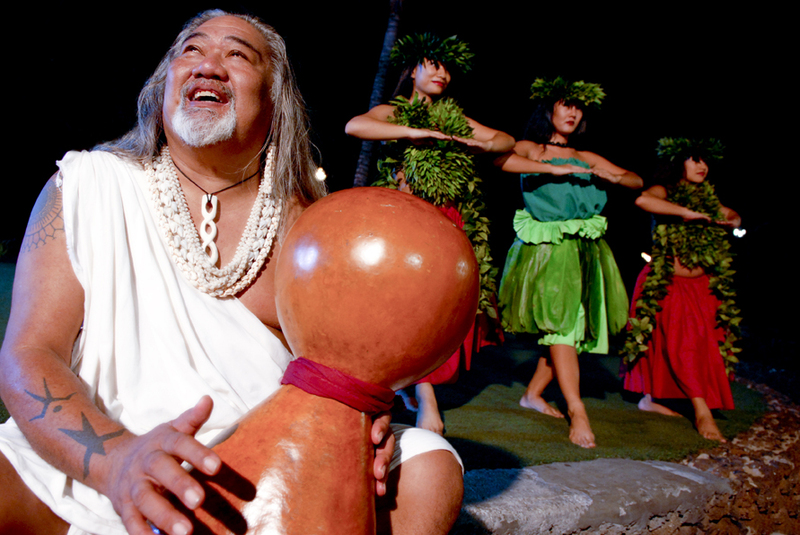 Just a fantastic show, hard to explain with words, but it is all about the demigods, myths and legends of Maui. The cost is $69.99/$79.99/$89.99 + tax, depending on seating, Silver, Gold or Platinum. Kids 6 -12 are $29.99/$39.99/$49.99 + tax. Kids 5 & under are free with paying adult. 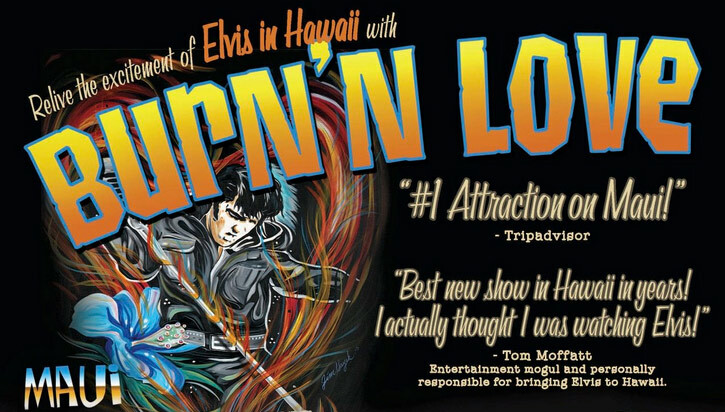 Newly added at the Maui Theater is Burn’N Love, An Elvis Show is offered 5 nights a week at 8pm. This is 90 minutes of fun and energetic music. This show is receiving Rave reviews for people of all ages! The cost is $69.99/$79.99/$89.99 + tax, depending on seating, Silver, Gold or Platinum. Kids 6 -12 are $29.99/$44.99/$54.99 + tax. Kids 5 & under are free with paying adult. Helicopter Tours. 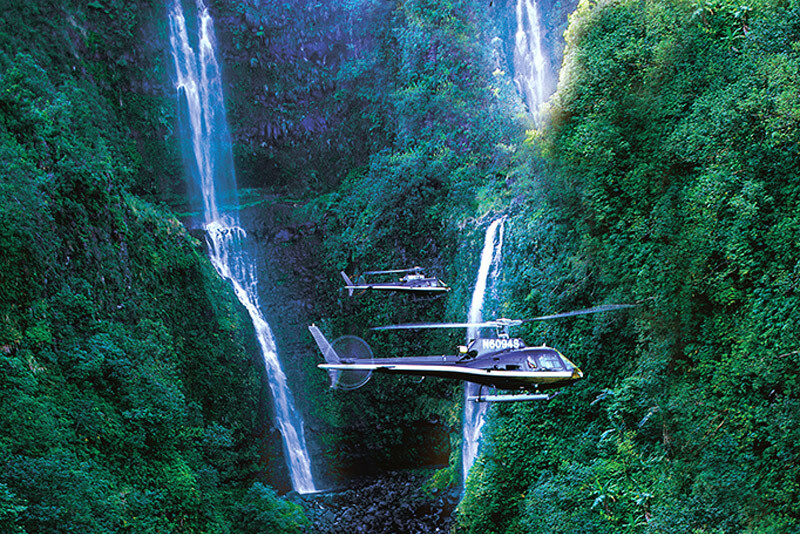 Explore Maui by air, see spectacular waterfalls, fly high above Majestic Haleakala, and see the parts of Maui you can’t get to by car. There might be a surcharge for a comfort seat, depending on weight (~250 lbs) and height. With the increasing cost of fuel, there is a fuel charge per passenger of $30 – $60 in addition to the rates above. Also First Class front 2 seats are available at a higher cost. And I am able to offer an Early bird Special when available. Ziplines, Pi’iholo Ziplines are located in Makawao, Upcountry Maui. Enjoy zipping side by side over the gulches and ranch land on the slopes of Haleakala. Or climb high into the treetops and cross ariel bridges and zip between the trees. 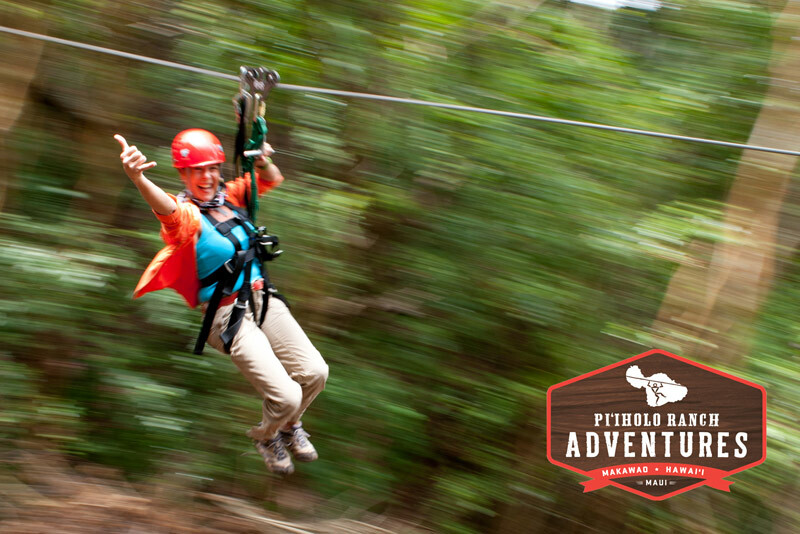 Participants must be at least 8 years old or older and weight requirements are 75 – 275lbs for the Ziplines, and 50 – 250lbs for the treetop tours. Sorry, you will not be allowed to zip if you are pregnant, back or neck injuries or recent surgeries. Rates start at $130 per person. Ask about specials. Inter-Island Tours. 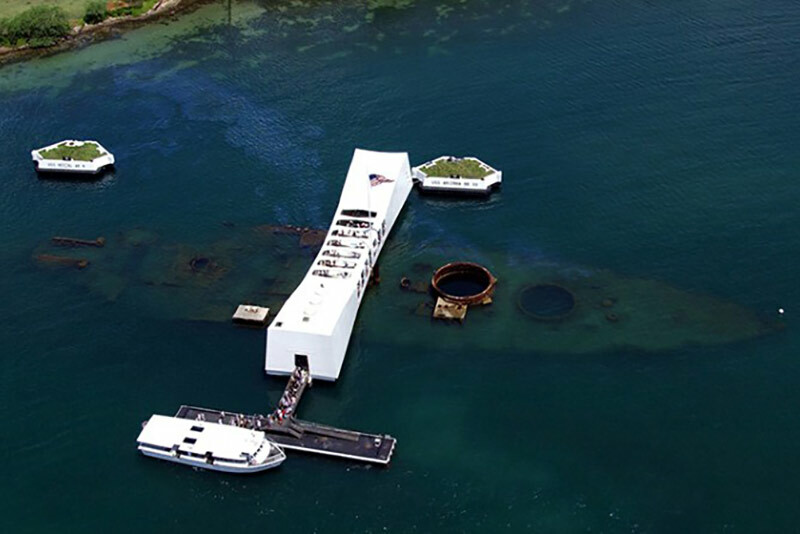 I can arrange for inter island tours to visit Pearl Harbor to see the USS Arizona Memorial. Or to the Big Island to view the world’s most active Volcano, Mt. Kilauea. Let me know what island you want to visit and we can determine what tour will work best for you. ATV Tours, Kahoma Ranch offers ATV tours, you can drive your own or share with a family member. They ride up on private roads and pastures in the West Maui Mountains and offer great ocean views. Lots of fun all the way around. All tours are 2 – 2 ½ hours. Snorkel Molokini, I highly suggest the Trilogy Discover Molokini Trip, it is a great trip. Departing from Maalaea Harbor, 7am – 12:30pm or 8am – 1:30pm. Includes continental breakfast with Mom’s homemade cinnamon rolls and BBQ lunch on board. 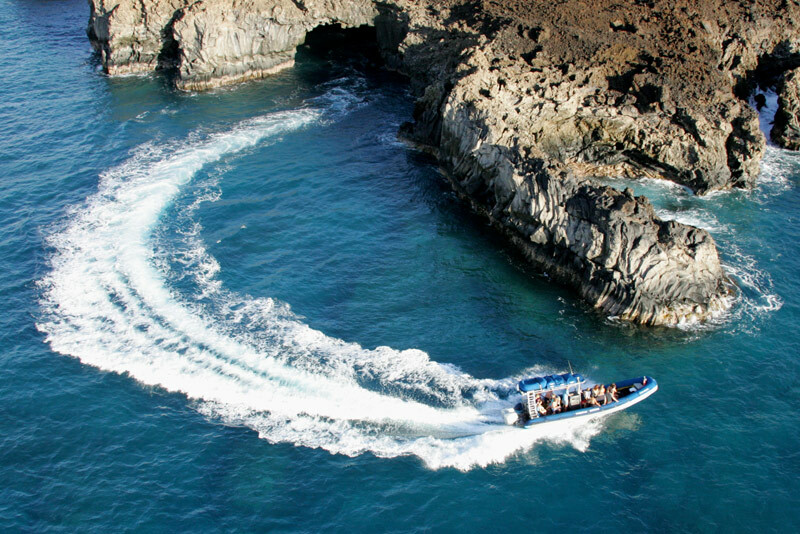 Snorkeling equipment & instruction included, 2 snorkel spots, Molokini and captain’s choice. Cost is $155 per adult + tax. Teens 13-18 are $135 each + tax. Kids 3-12 are $90 each + tax. For an adventurous snorkel trip, try Blue Water Rafting. This trip goes out in the Zodiac style rafts and heads south to the Kanaio Coast of Maui to the sea caves. Then back towards Kihei with a few stops for snorkeling. Many opportunities to see turtles and hopefully dolphins too. They provide all snorkel gear and instruction and a deli style lunch with beverages. Snorkel Lanai, I recommend the Maui Adventure Cruises, on a hard-bottom inflatable raft. It is the largest of the rafts that can accommodate up to 48 passengers and has a restroom on board. They leave out of Lahaina Harbor. They offer a 1/2-day trip that includes continental breakfast, deli lunch, and 2 snorkel spots. The crew is a lot of fun. The price is $109 for adults, $84 for kids + tax. The Trilogy Discover Lanai Trip is a full day adventure. Departing Lahaina Harbor, Monday through Friday 6:30am and return back at 2:30pm. Includes continental breakfast with Mom’s homemade cinnamon rolls and BBQ lunch at the pavilion overlooking Manele Bay. Snorkeling equipment & instruction included, volleyball, Van tour of Lana’i’s old plantation town. Cost is $245 per adult + tax. Teens 13 – 18 are $210 each + tax and Kids 2-12 are $135 each + tax. 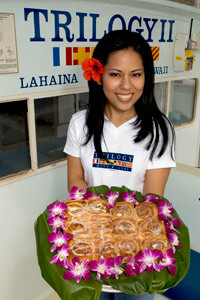 They also offer a later sunset trip with dinner that departs Lahaina at 10am and arrives back at 6pm. 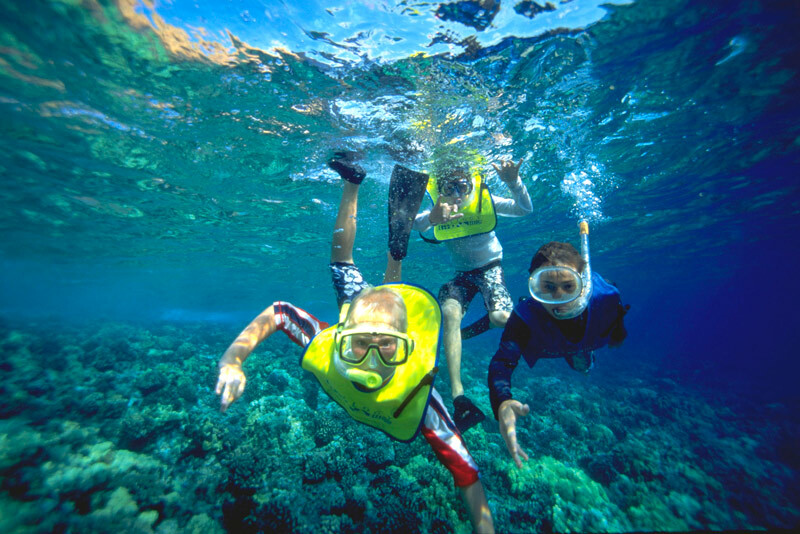 The Hula Girl Snorkel Trip departs from Kaanapali Beach at 9am and returns at 2pm. 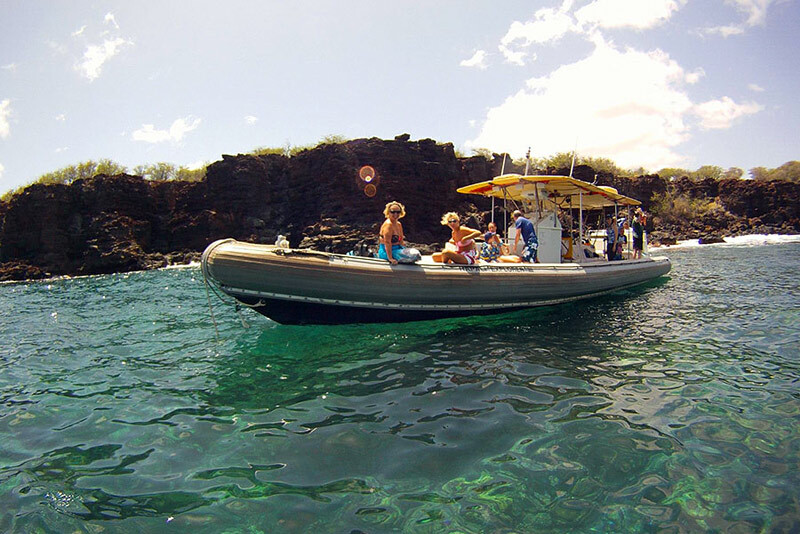 They motor up to Honolua Bay, which is a marine preserve and offers great snorkeling. This catamaran is beautiful and comfortable, large cushions to lay on in the front of the boat, booth tables to eat at. And go up to the captain’s deck while they are sailing back to Kaanapali. The Hula Girl has a Galley and chef on board to prepare meals. À la Carte menu so food and beverage are not included, however they are available for purchase. After lunch, they hoist the sails and sail back to Kaanapali Beach. Cost is $114.31 for adults and $98.24 for kids 12 and under. Scuba Diving is available for an extra charge. 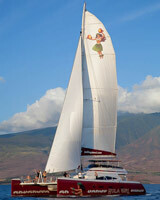 The Hula Girl has a nice sunset sail that departs from Kaanapali Beach at 4pm and goes out for 2 hours. A bit more romantic as there are not so many people and it is a much more intimate setting. 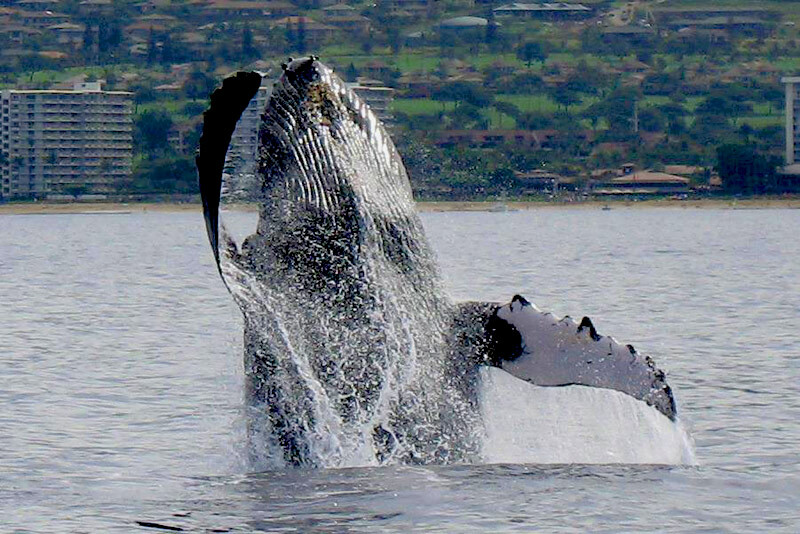 This trip will include whale watching too during whale season. Cost is $70 for adults + tax. Offered on Monday, Wednesday and Fridays. Dinner cruise is offered 3 nights per week, Tuesday, Thursday, Saturdays. Cost is $83 per person + tax. Food and beverage are à la carte on both cruises and the menu ranges from $5 pupus to $20 main course. Surf Lessons are popular for teens, but suitable for all ages. 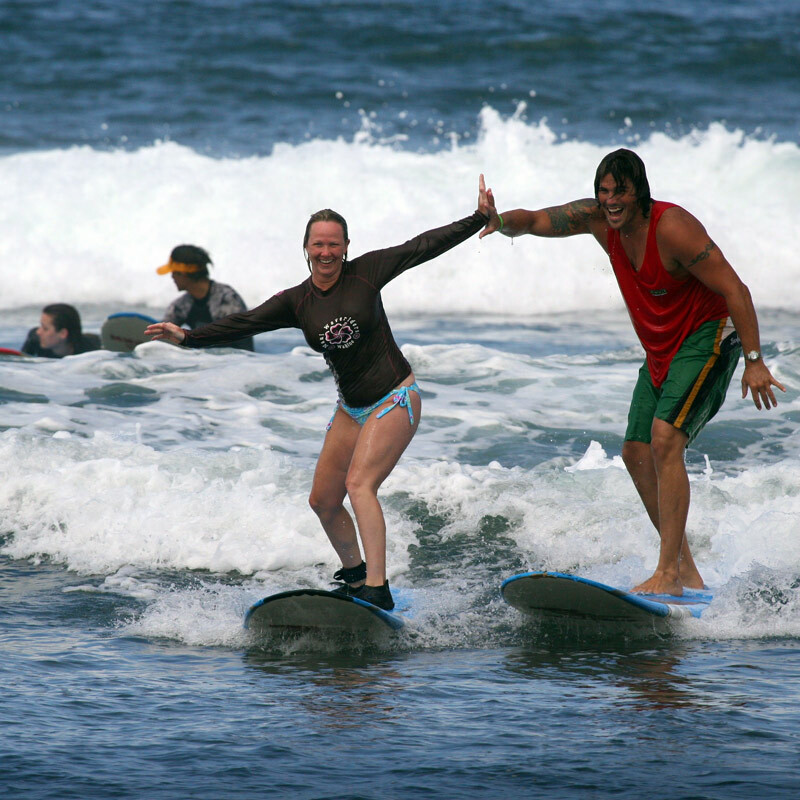 They offer 2-hour small group lessons and guarantee that you will learn to surf. After the lesson, you can stay and use their boards if available to practice. Cost of the lesson is $65 per person + tax for a group lesson, $85 per person for semi-private lessons. Lessons available in Lahaina and Kihei. Horseback Riding, you really have to decide of whether you want to ride in the crater, the rainforest, to a waterfall, in lava fields, or a pineapple field. No companies ride on the beach. Costs range from $199 – $185 per person + tax. Ironwood Ranch is located in Napili. 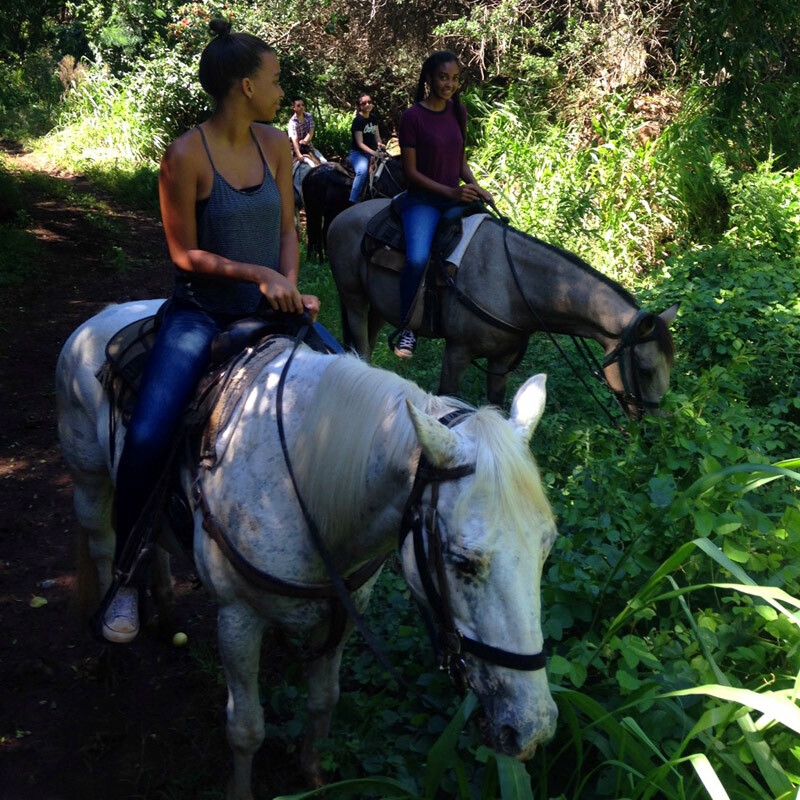 Ride one of their many horses through the Ironwood Forest and pineapple fields. 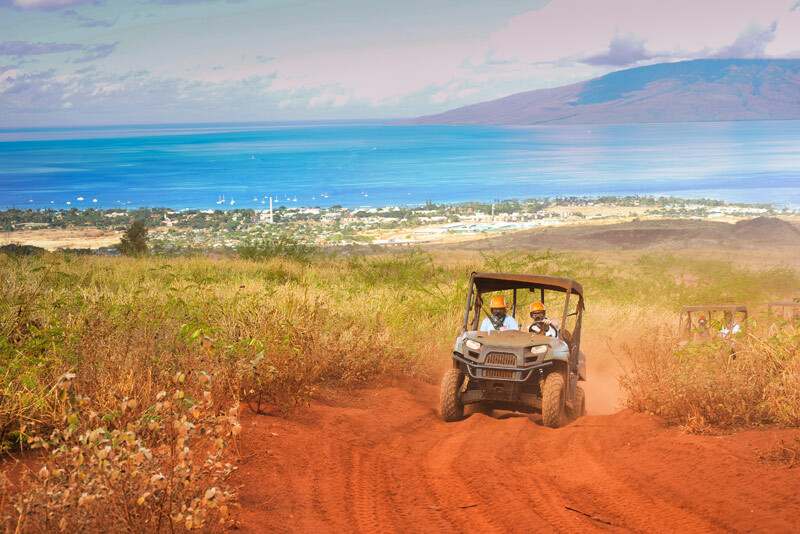 Enjoy the vista views of Molokai and Lanai, even a sunset ride. Rates starting at about $100 for a 1 ½ hour ride. 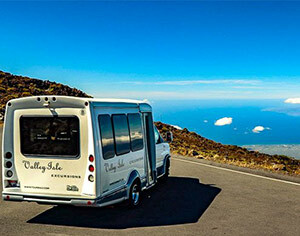 Haleakala Sunrise: I recommend touring with Valley Isle Excursions. It is a full day trip, about 8 hours. Valley Isle Excursions will pick you up at your hotel. They have custom cruisers with huge viewing windows to accommodate 12-24 passengers. Journey to the top to the crater to watch the sunrise. Includes hotel pick up, continental breakfast prior to sunrise and a hot buffet breakfast after sunrise. Cost is $179.99 per person + tax, kids are $159.99 each + tax. Be sure to wear warm layers of clothing as crater temperatures will be about 40 degrees lower than at sea level. Hana Van Tour, I recommend Temptation Tours. They do a first class tour in a luxury Limo van. There are large captain’s chairs and it is a real spacious and comfortable van. A big cooler of drinks is kept in the back and the lunch is a beach side picnic on White tablecloths, excellent lunch with salad and a 1/2 smoked chicken, pasta salad and cookies for after. Also includes a continental breakfast. Lots of stops, you can swim in a waterfall pool. Cost for this trip is $219 + tax. Or if you want to venture all the way around the South end of the island, visit the Ohe’o Gulch area and the Tedeschi Winery, the tour with Valley Isle Excursions. Individual Captain Chairs in a 12 – 24 passenger Cruiser Van with Buffet style hot picnic lunch. Adults are $169.99 + tax, Kids 12 and under are $149.99 + tax. Private charters available. 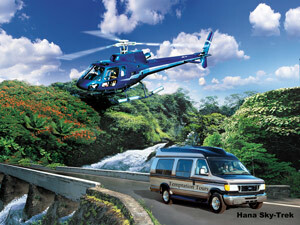 If you don’t want to spend all day on the Road to Hana, Combine the van tour with a helicopter tour. You can fly to Hana and van out or van to Hana and fly out. Only a 5 hour day, cuts the drive time in half. Cost is approximately $344 per person + tax and fuel surcharge. For the whale watch, you can enjoy seeing whales from your snorkel boat, but if you feel like you need to see additional whales, then you can join a whale watch trip from $25 – $70 per person. There are a variety of different boats to choose from, departing from Kaanapali, Lahaina and Maalaea Harbor. Parasailing, May 16 to December 14 is done by the Kaanapali Area. 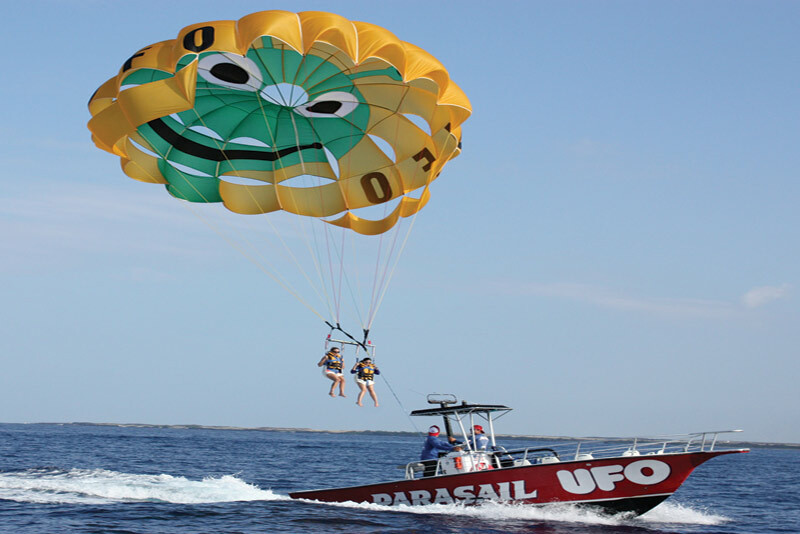 I use is called UFO Parasailing. They can take up to 12 people out on the parasail boat at one time but normally limit it to 8 for comfort. Each person or group gets a flight between 7 & 14 minutes long. Short but it seems like a long time when you are sailing up there. You take off & land right on the boat. The 800 foot Deluxe Ride is $84 + tax per person and is 8 minutes long for a single flyer, 10 minutes for tandem flight. The 1200 foot Out of this World Ride is $94 + tax per person and is 10 minutes long for a single flyer, 12 minutes for tandem. Non Flying Observer on the boat is $39 + tax.